At night. 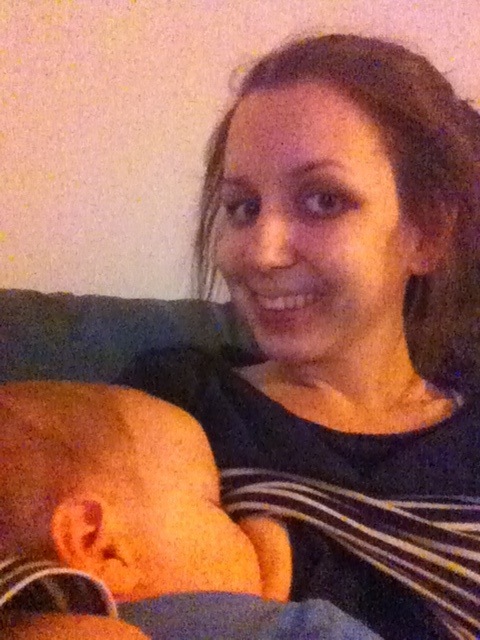 | Today I Breastfed. Ethan is now 22 months (and 9 days) old. Every night when I am here (I work 2 nights a week), I feed him to sleep. Every night. Every night, if he wakes, I feed him back to sleep, in my (and my other half’s) bed. In all of his 22 months so far, Ethan has never ever been left to cry alone without comfort. And he never will be. We never really decided to not let him cry. We followed our instincts. From when he was born, if he cried, every instinct in me tingled to respond to him and solve whatever was wrong. It physically hurt me to hear him cry. So he was never left to cry alone. As he got older (6 months? Absolutely geriatric! ), we were told we were spoiling him, giving in, making a rod for our own back, why wouldn’t we just leave him cry?! That’s around the time I started doubting our instincts (no idea why, we were perfectly happy until other people decided to give their opinions) and started researching. And you know what? It’s normal. It is fundamentally biologically normal to respond to your baby/toddler/child, and adjust your response to their needs at that particular time. Babies expect this. They expect to be close to you (they have been for 9 months, it’s all they know! ), they expect you to respond when they need you. Babies, regardless of where they’re born, are still cave babies. They have the same reflexes and instincts human babies have for thousands of years. That instinct is to survive. If cave babies were left alone, they’d be eaten by a sabre toothed tiger. If they’re alone, they cry, when they cry alone, their stress hormone levels rise, which causes neurological changes. It messes with their attachment and trust with caregivers. But, I hear you cry, my friend/auntie/cousin left her baby to cry and they learned to sleep through. Or b) shutting up, saving energy, not attracting the attention of a hungry wolf. The answer’s obvious. You’d be quiet. However, the stress levels in the now silent baby’s brain is still raised. They’re still stressed. Distressed. And that is why I will always respond to my child’s needs, whether he’s 22 hours, days, months or years old. Children are blessings, not inconveniences to be controlled. This entry was posted in Uncategorized and tagged baby, breastfeeding, child, feeding, food, mother, mothering, nourishment, nursing, parent, Parenting, Sleep, toddler by Today I Breastfed. Bookmark the permalink. Of course. It’s important to distinguish between being left to cry alone and crying when being comforted or talked to. No one expects children or babies to never cry – of course they will, for a multitude of reasons.